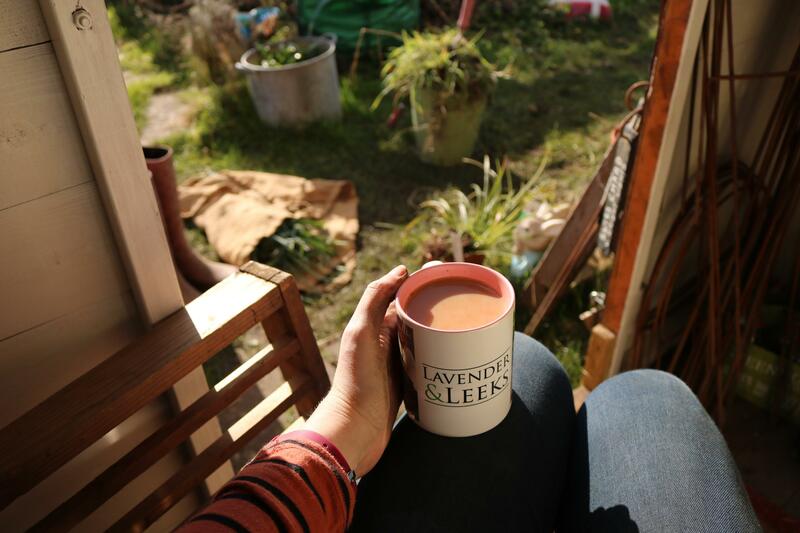 The little purple potting shed is the heart of plot 15c, I spend half my time here pottering my worries away or sipping on a hot cup of tea and I really couldn’t imagine my allotment without it. 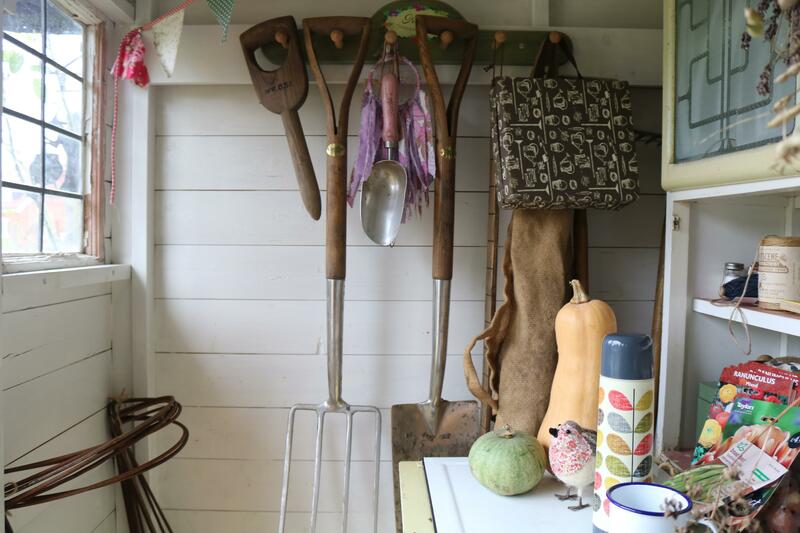 It features a lot on my social media pages and I often get asked questions about it so I thought on this rather dreary November day I would write a blog post all about my little shed. 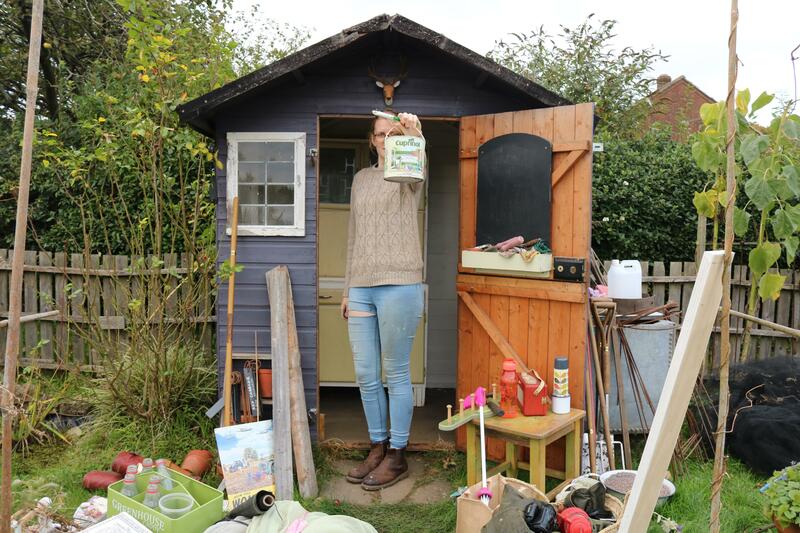 I knew straight away after getting my allotment that it needed a shed and I spent a a couple of weeks searching for a second hand one. Shed’s can be very expensive and even though it’s worth spending that extra money on a decent one I just didn’t have the cash. I soon stumbled across one on Gumtree which wasn’t that far away, only problem was it’s size… it was 8 by 6 foot! 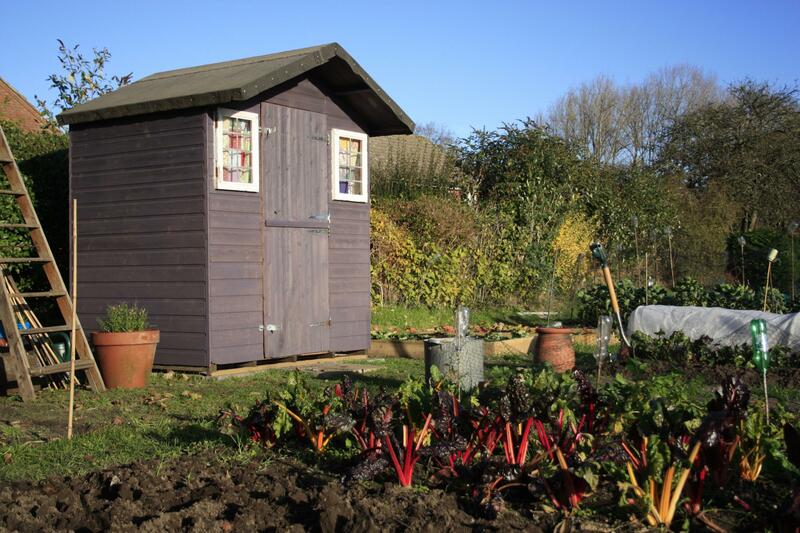 Our allotment site only allows buildings no bigger than 6 x 4 foot so both me and my Dad came up with a conclusion, the shed would need to be cut down to size. 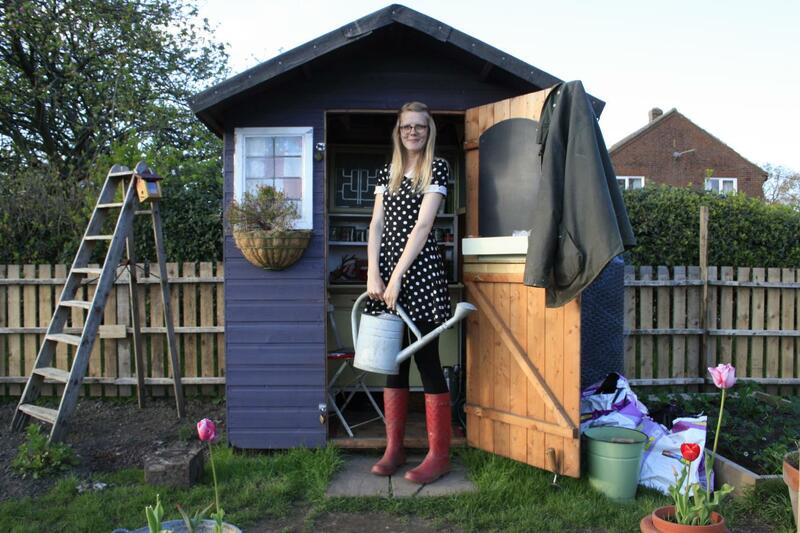 I actually managed to get my shed for a mere £30.00 which I was so happy with, brand new ones can cost anything from £300 upwards! 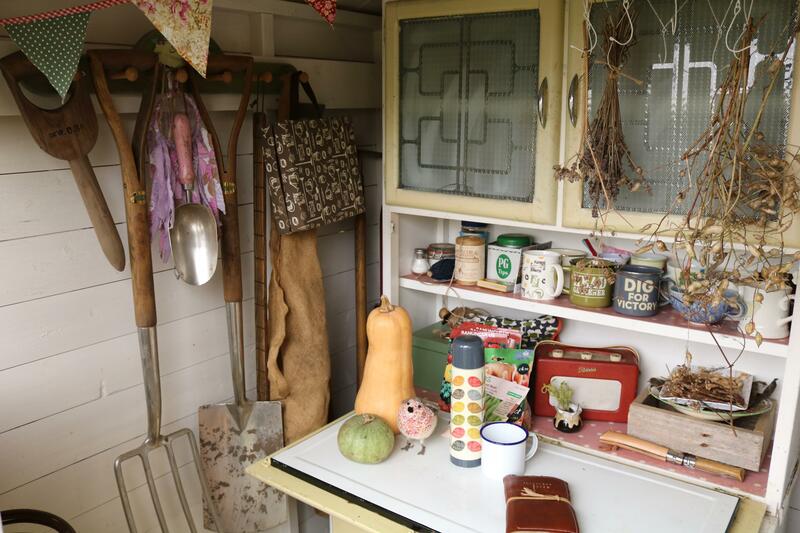 The first addition to the shed was a beautiful vintage, 1950’s kitchen cabinet that was won on eBay for £30.00. I was so lucky in getting this piece and I just love it so much, you’d be surprised at how much it fits inside too! 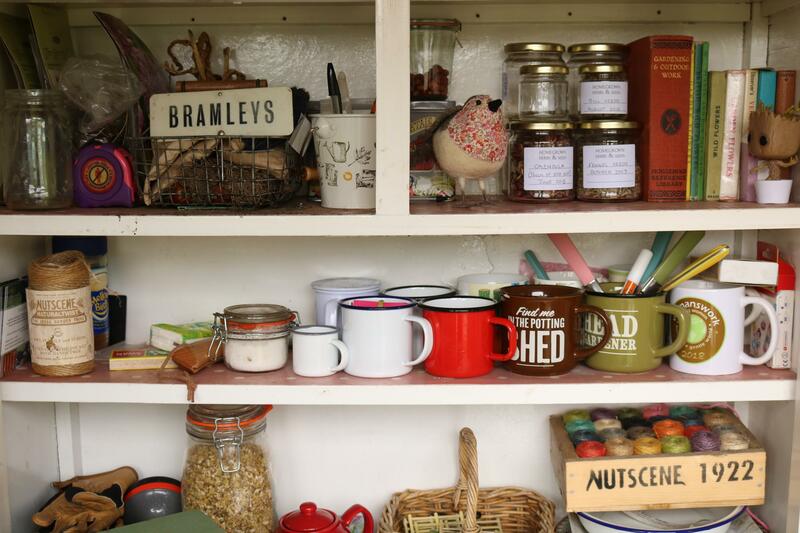 There’s old terracotta pots, netting pegs, bulbs, gardening books, twine, jars of saved seed and dried herbs, labels and of course the most important tea making necessities! The most important addition sits nicely next to the cabinet and it helps makes the tea! My little Calor B700 gas oven was also purchased from eBay and came all the way from Scotland. After replacing a few old pipes and making it safe to use it ended up costing me a whopping £60.00 but every penny was well spent because the cooker is always in use. 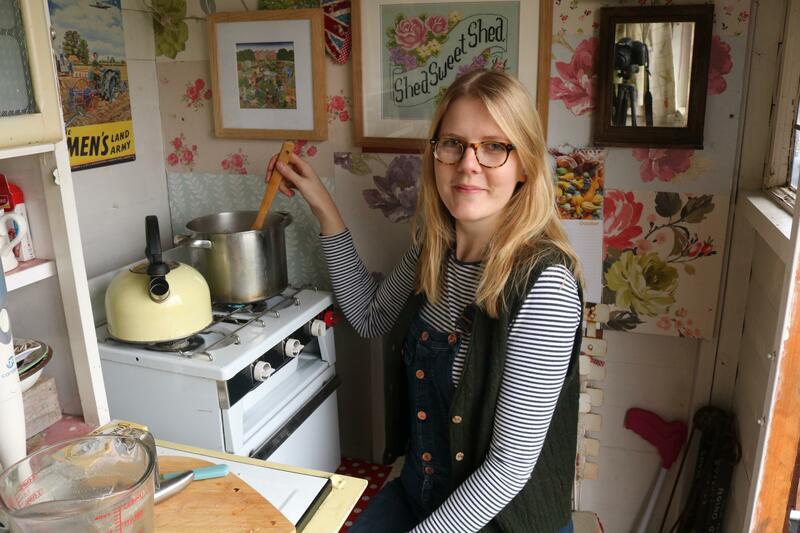 It also inspired me to start a new series of videos and that’s when the Allotment Kitchen was born. 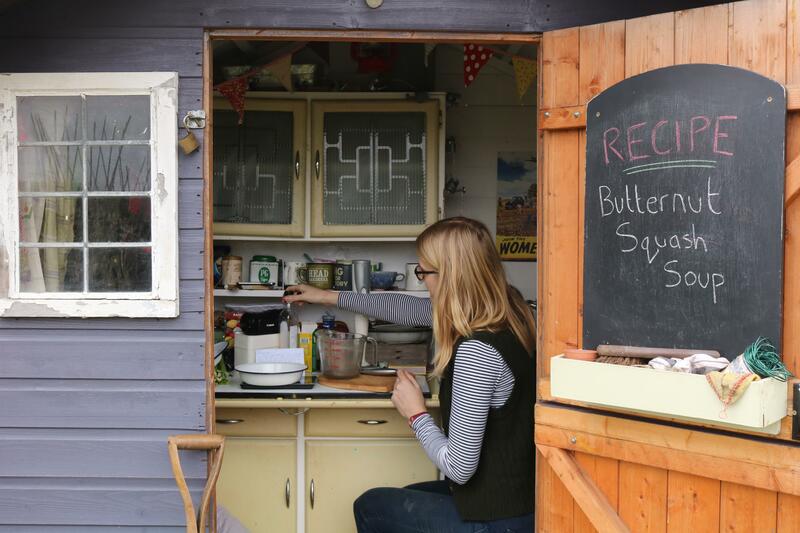 So many delicious recipes have been cooked up here in the shed and of course nothing quite beats popping the kettle on after finishing a gardening job on the plot. 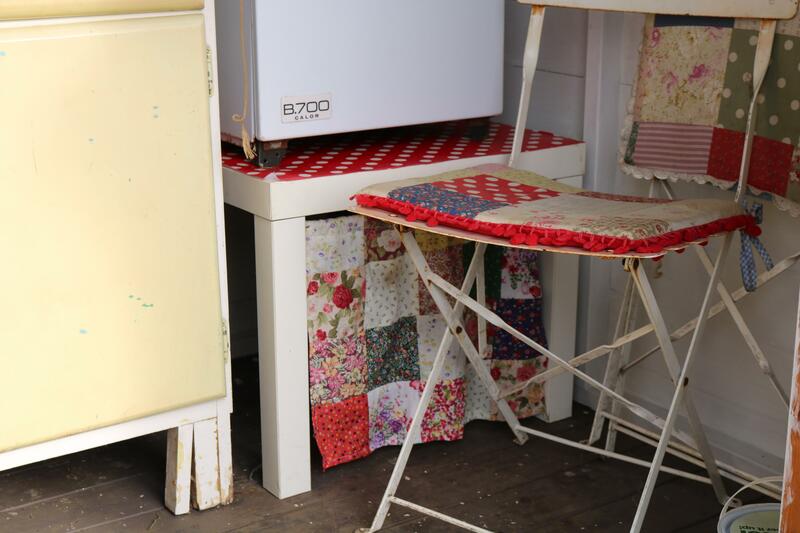 The cooker sits on a cheap table from ikea and the gas bottles lives under that (which is kept hidden by a handmade patchwork curtain!) 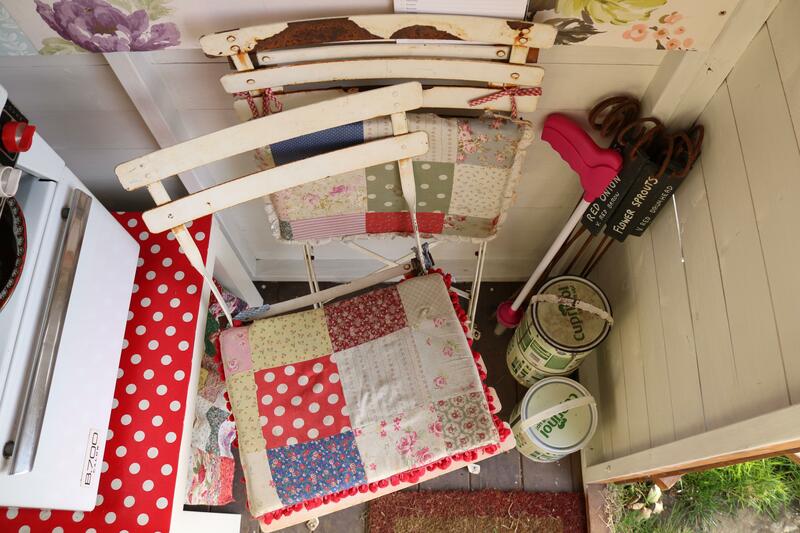 Of course I also needed somewhere to sit and so I picked two old folding seats up from a market 5 years ago and made new patchwork seat covers to match the curtains whilst also making the chairs more comfy. 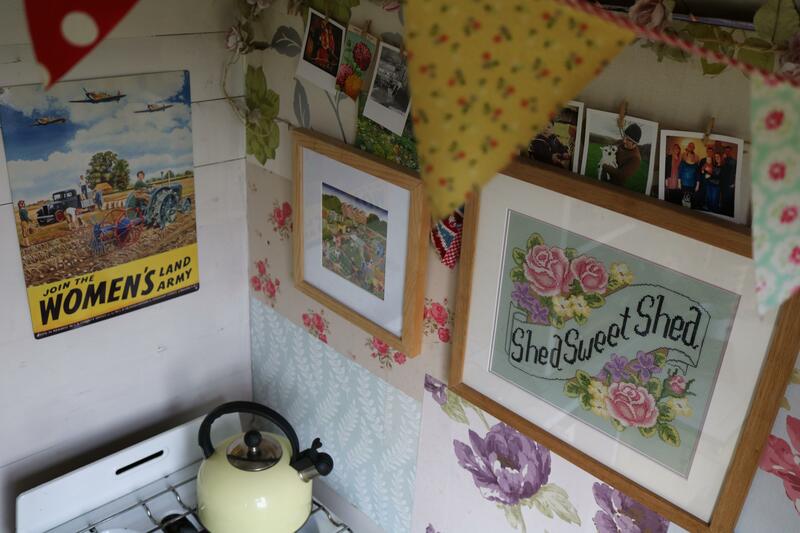 There’s a metal Women’s Land Army poster above the cooker and it inspires me daily although I do have plans for this area. I would love to make or upcyle a couple of shelves above the cooker to store all my plates, cooking ingredients and to also hang my pots and pans from. This would then free up some of the cupboard space inside the cabinet for more gardening bits and bobs. That’s the plan anyway! 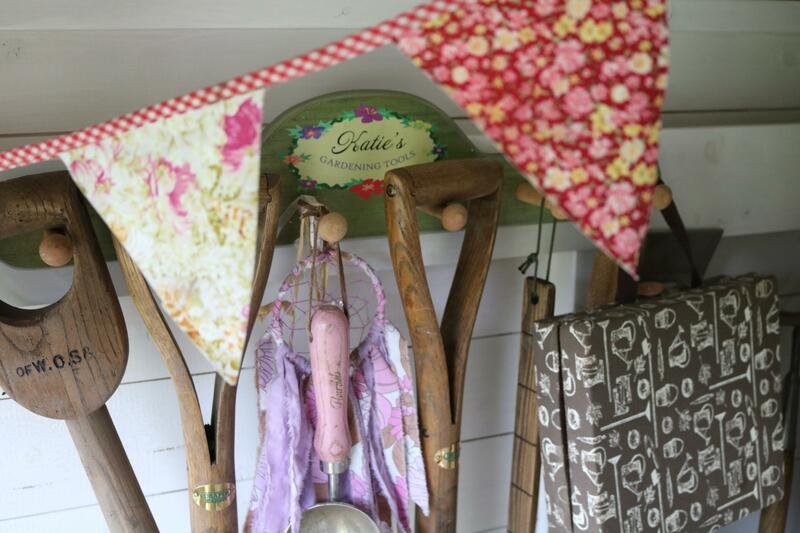 The newest addition to the shed is a beautiful old kitchen drying rack, I spied it at one of the antique fairs we visit and instantly knew it would look perfect hanging in the shed. I was in the process of making a rack to hang from the ceiling but when I spotted this beauty I fell in love! Therefore the rack I was making now sits on top of the cabinet’s work surface and smaller flowers like Calendula are left to dry here. 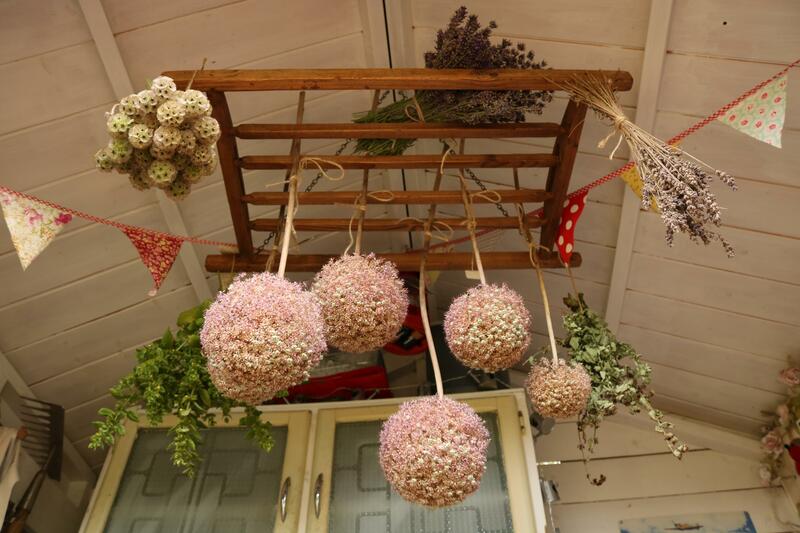 Alliums, Scabious Sternkugal, bunches of herbs and Lavender are either hanging or sitting on top of the drying rack which is attached to the ceiling via chain. 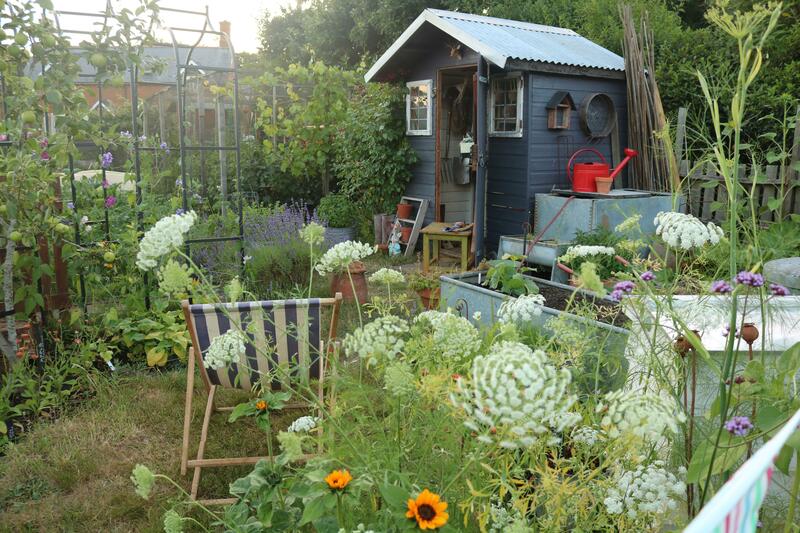 Ideally I would love a shed with a high ceiling so that I could stand inside without hitting my head on all the flowers! 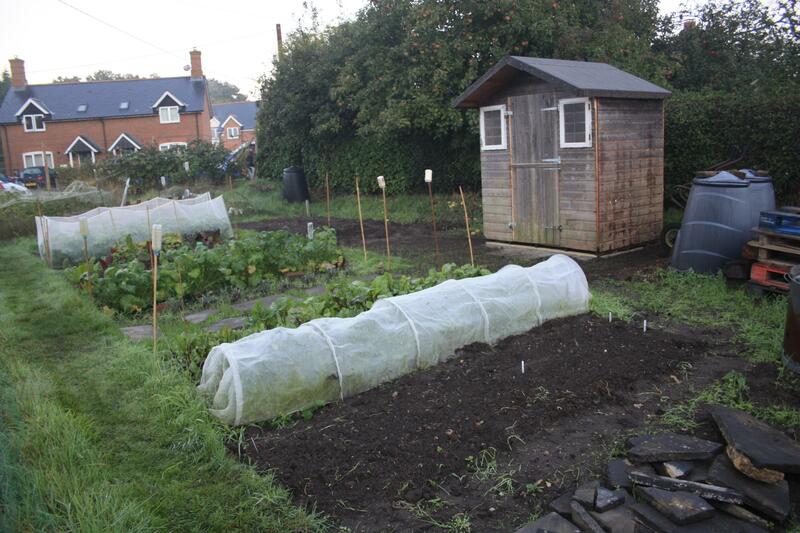 However for now this one can be removed when it’s not in use and simply stored away in the shed. The outside of the shed hasn’t really changed much, the same Lavender paint has been reapplied throughout the past 5 years and various attachments have been added. 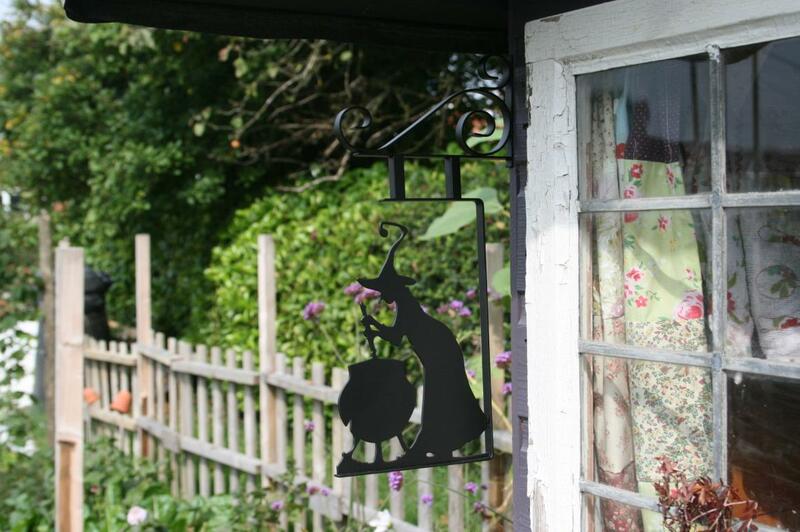 One of my favourites is the Harry Potter ‘Leaky Cauldron’ pub sign which nestles amongst the rose bush, this was picked up from a comic convention and as a Harry Potter geek I just had to have it for the shed. On the other side of the shed houses the old galvanised water tank and above that sits an old sieve ready to use with my homemade fertilisers, an empty bee house and a stack of bamboo bean poles are stored there as well. 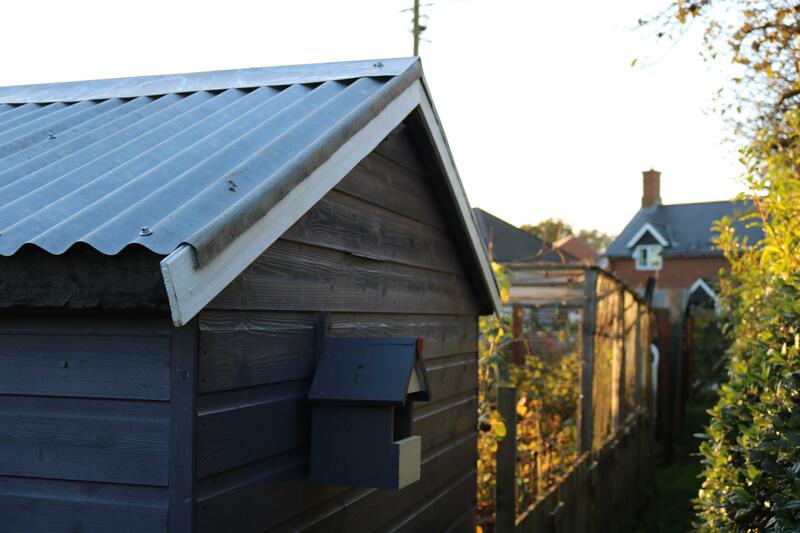 There’s even a bird house on the back painted in the exact same colours of the shed! The most noticable change has to be the roof though and it was one of the jobs that took me years to complete! I knew from the very beginning that I wanted a galvanised roof on the shed and I had purchased the sheeting over 3 years ago. It wasn’t until last November that I got round to putting it on the shed with some help from my Dad but boy does it look good! The rain sounds so beautiful against the metal and it will last a very long time. The finishing touch was the fascia which I painted the same colour as the inside of the shed and I have plans to attach a sign to the very top of boards to help cover the gap and to also officially name the shed. And that’s that! 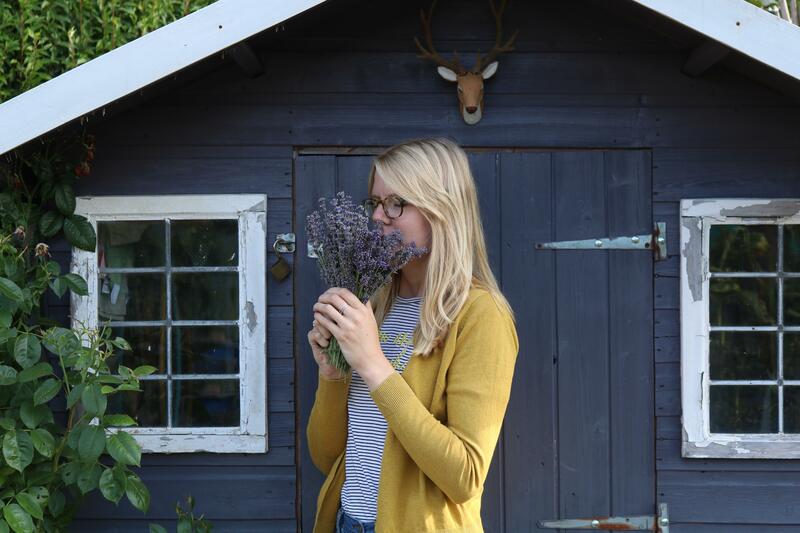 My little purple potting shed, my absolute pride and joy and my little haven. 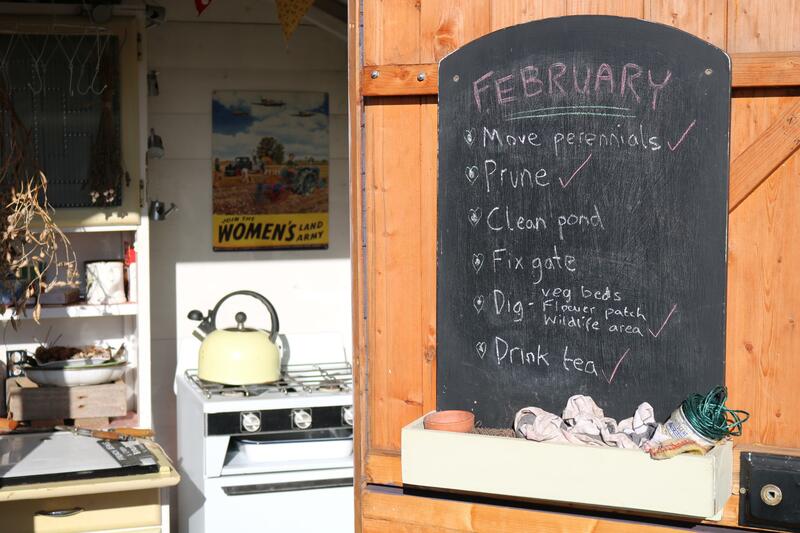 Every allotment needs one in my opinion, not only as a place to store all your tools but as a sanctuary to hide in when it rains and a place to sip on a nice hot cup of tea whilst you survey your land. I loved having a space I could really make my own with it’s individual unique quirks, some people might think it’s a tad over the top but I wouldn’t change it… although if it was a tad bigger I wouldn’t complain! Buy a good quality shed, shiplap/tongue and groove will last a lot longer then a simple cheap overlap cladded shed which might only last a few years. 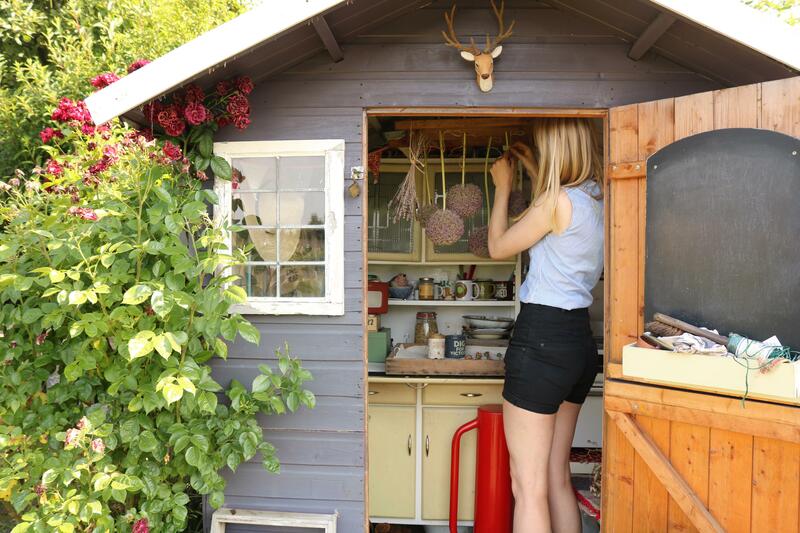 Preserve the outside by staining or painting it and remember to re apply every 2-3 years to prolong the shed’s life. 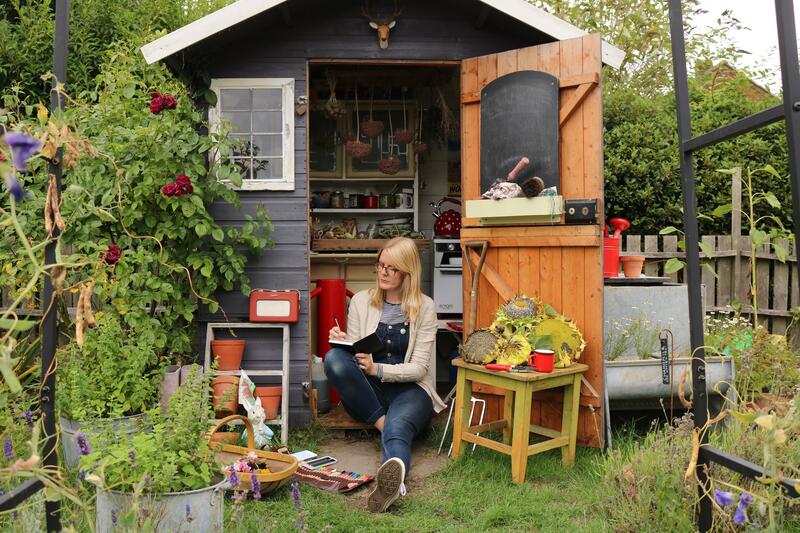 Create a good base for your shed to sit on. I used paving slabs as well as strips of wood to keep the floor off the ground which will help prevent it from rotting. Use good roofing material such as roofing felt or galvanised sheeting. Think about size and what you want to store in there. 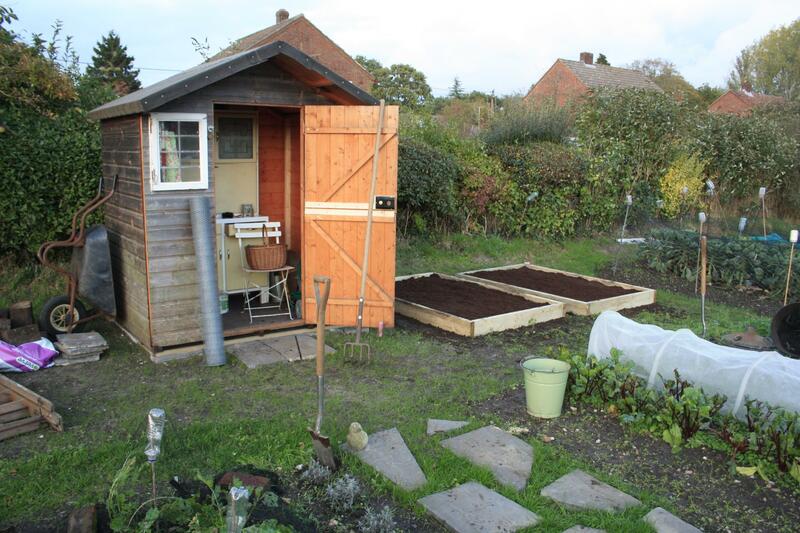 I’m limited to 6×4 foot on our site but I would love a 6 x 8 foot shed with room for a large potting bench down one side. I use 3 locks on my shed, an internal lock and two padlocks. We’ve never had any problems on our site but I’ve heard some people leaving their shed’s unlocked with no valuables inside to prevent damage to the shed if they were to be broken in too. Something to take into consideration. Keep checking for mole hills or long grass growing around the shed as they might cause the bottom edge of the shed to rot. I used to have to regularly move mole hills away from the back of the shed for this very reason! Make it your own! 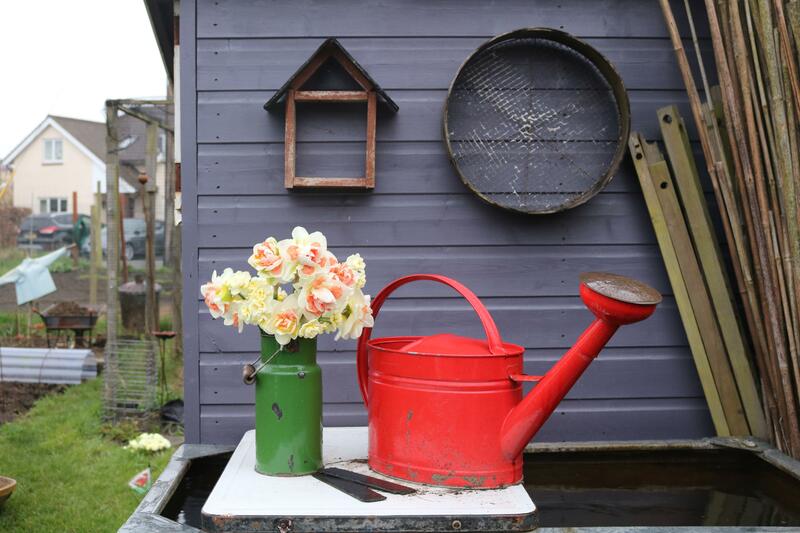 Have fun and customise your shed to suit your personality and character. 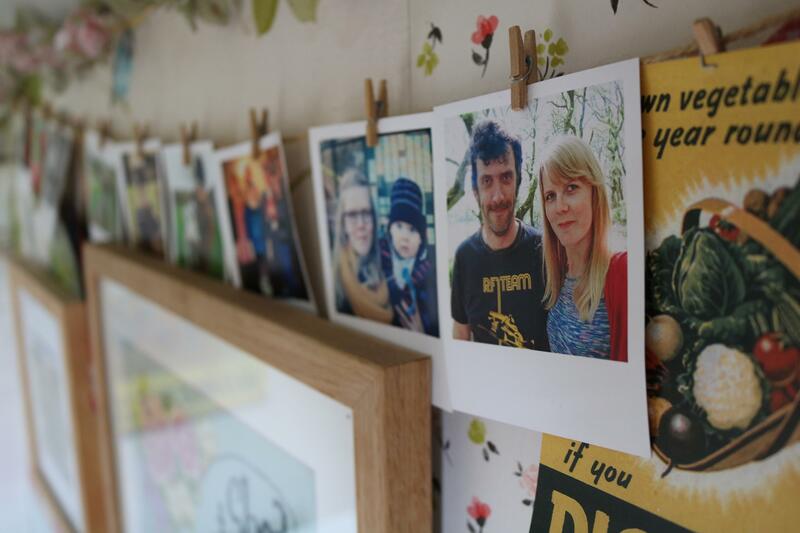 Thank you so much Louise and I’m glad you like the shed! 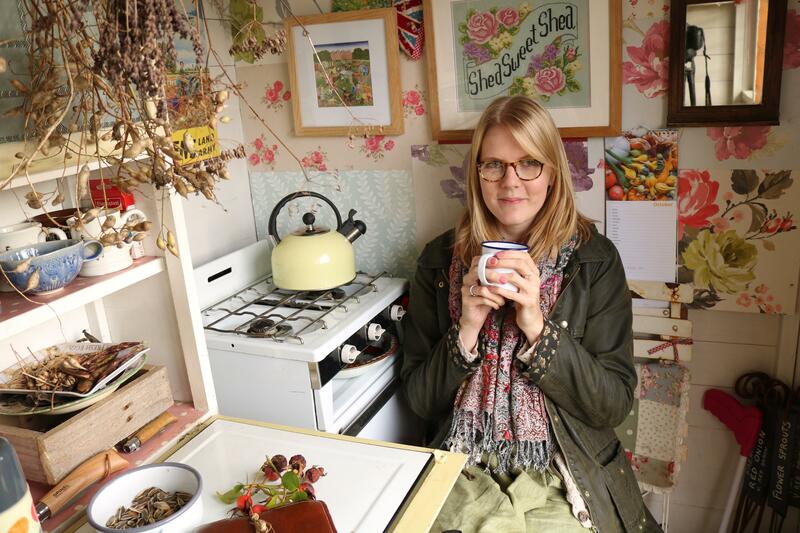 Your blog looks amazing too, I just had a quick peek and I’m glad to see you made some sloe gin. I also made a couple of bottles to give as Christmas gifts this year (and maybe one for myself too?!) Congrats on being featured on the Thompson and Morgan website too! 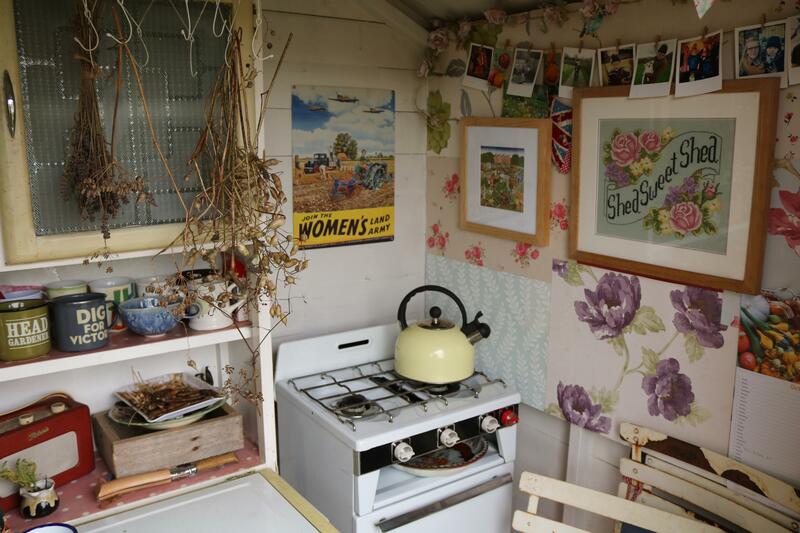 I love your Little Purple Potting Shed. The pictures are splendid. The shed is splendid. And you’re super! Just returned from the madness of the huge shopping Mall at Gateshead, the beautiful tranquil pictures that Katie has uploaded on here, have restored my equilibrium! The connect to nature is so essential for the mind, so wish younger folks would discover it. Wonderful pictures Katie! Thank you so much Barbara and I hope your shopping trip was a success? Thank you so much Lance, means a lot to hear that! 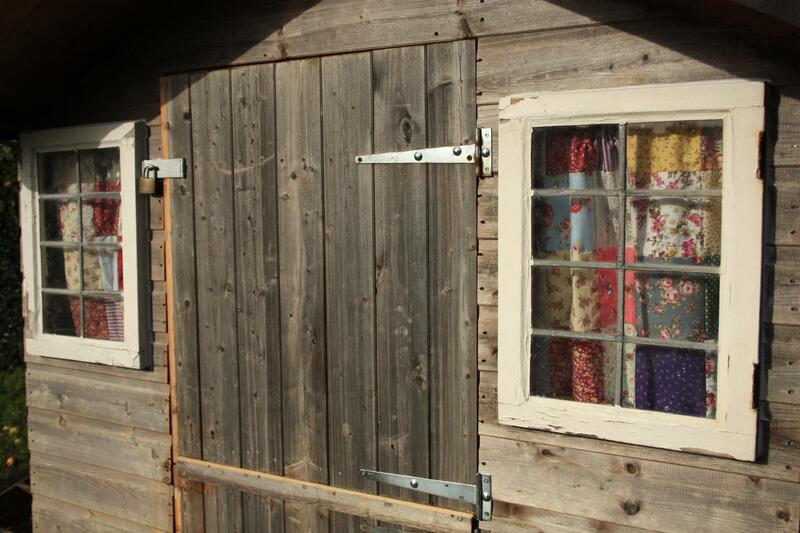 Katie, I love your little shed and especially the quilted curtains and seat covers! Totally inspired by that…Wanting to pin those images! WOW!! 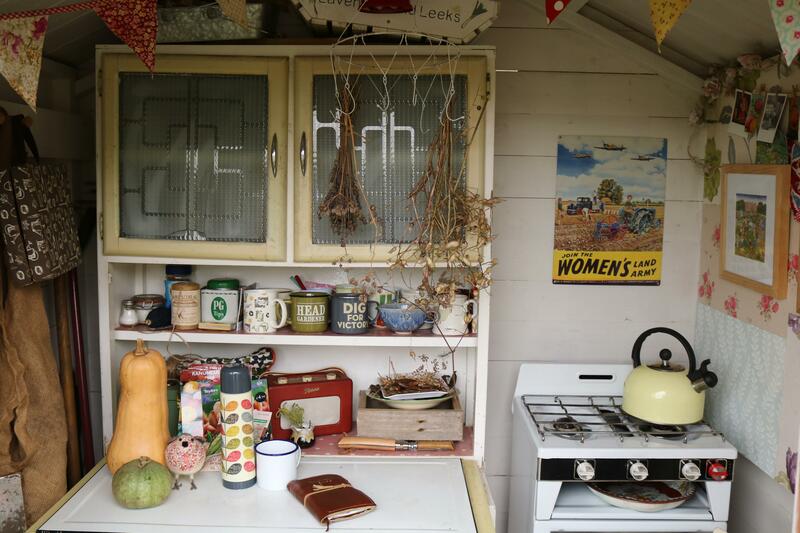 your purple potting shed is just gorgeous. 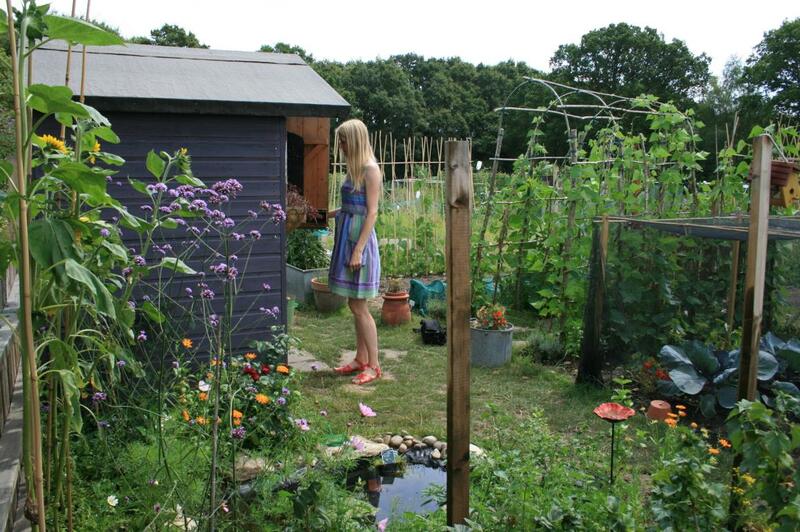 Where I live we don’t have allotments so I always look forward to reading your blog and seeing what you do. Honestly what you do is inspiring to someone like myself who doesn’t have the opportunity to have something this lovely. So you should be proud of what you do. I have never been to the UK so the fact that there are blogs and other things that I can see from afar is just really lovely. Please keep doing what you do and sharing your beautiful garden and photos because far away there are people like myself who look forward to seeing it.